Somewhere between reality and the imaginary, the Doudou Museum takes visitors right to the heart of the Ducasse de Mons. Every year over Trinity weekend, the people of Mons come together to pay tribute to Saint Waudru and witness the legendary battle, known as Lumeçon, pitting Saint George against the Dragon. Somewhere between reality and the imaginary, the Doudou Museum takes visitors right to the heart of the Ducasse de Mons. The fact that Mons’ Doudou (Ducasse) was recognised by UNESCO in 2005 was by no means an accident. Trinity weekend is a really special time in Mons. Time stands still and the city is filled with an incredible energy. It is often said that the Ducasse creates the tempo for the city and its residents. 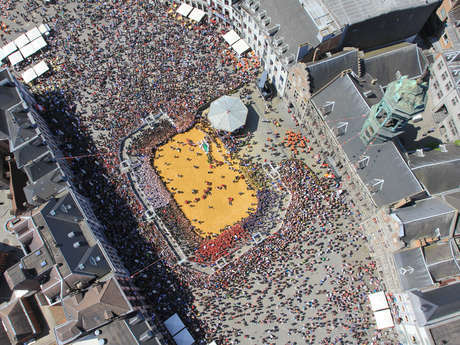 The Doudou in Mons is a sacred event. Many see it as Mons’ New Year. The descent of the Châsse de Sainte-Waudru, the procession, the climb of the Car d'Or, the battle known as Lumeçon... So many highlights that no citizen of Mons would dare to miss. So what is it that drives local residents to get together and experience this event as one? How has Mons’ Doudou been passed down the centuries? What is behind all the highlights of the Ducasse? Why does Saint George fight the Dragon? Why do we need to create these legendary characters? To understand what lies behind this exceptional legacy, the Doudou Museum looks at all the different aspects of the event. All the different facets of Mons’ folklore and heritage have been analysed with a fine-tooth comb, sometimes from some rather unusual angles. Mons’ Doudou is explained through history, anthropology, art, religion and science. Behind Saint George and the Dragon, visitors are introduced to all the different symbols. This event, which has been passed down through the centuries, ultimately asks some really important questions about our society. Housed in the former Mont-de-Piété building, built in 1625, the Doudou Museum is passionate about interaction. The experience is all about interpretation, and visitors can (re)experience all the highlights of the Ducasse through all sorts of objects, of course (Saint George’s helmet and lance) as well as through screens, videos and interactive terminals where young and old can really get into the whole experience. Seeing behind the scenes of the Ducasse you can understand its popularity and unifying spirit. This is what spoke to and moved UNESCO. The participation of local residents in the battle and the climb of the Car d'Or, the investment of hundreds of volunteers throughout the year, the passing on of the tradition to the next generation… Whether you are a local or not, whether you are familiar with the Ducasse or have never taken part, you are bound to leave the museum with all sorts of images running round in your head.